I offer classes and also individual training. What Can an Aura Camera Show You About Your Energy? An experiential class! 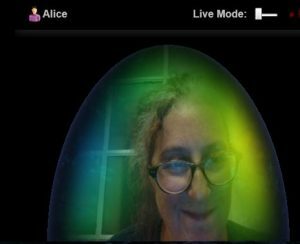 Come and see how the aura camera shows your state of balance, and try some things (meditation, Reiki, crystals, visualization) to see how they change in real time! Every attendee will get an aura camera reading (with 20 page report emailed by pdf) and have the chance to experience something new! Reserve your spot by clicking the button below. Individual Learning with Me – by Yourself or Invite Friends and Get a Buddy Discount! This 4-session course series will give you the specific tools and practices you need to offer Intuitive Counseling sessions to clients. Cost: $427 (I also offer a Buddy Discount: bring one or more friends and save $30 per registration.) All materials are included. >>>Choose your dates and sign up for 4 90-minute sessions using this link. Practical Reiki is a strong, revolutionary, modern approach to energy healing. Whether you are new to energy work, or a seasoned professional, Practical Reiki will empower and strengthen your connection to healing energy. There are no hand positions. The hands-on treatment involves placing hands on or over the recipient and letting the energy flow where it is needed. Distance healing involves simply intending the energy to go to the recipient, holding the hands facing each other, and letting the energy flow until it stops (usually about 5 minutes). Can easily be combined with any other technique. Powerfully experienced by practitioner and recipient alike. No matter if you’re new to energy healing, or a seasoned expert, this training will expand your knowledge, strengthen your healing connection, and benefit you personally and professionally. All participants will receive a Practical Reiki Level 1 Certificate at the end of the training. Note: This course requires the Practical Reiki book and The Practical Reiki Companion workbook. Available on Amazon, or for purchase in my office at $25/set. Also, some preparation work is required. You will be sent a video to view, and it would be helpful to read the first five chapters of the book and do the first four in the workbook before class. Single session, 2.5 hours, cost: $147 (Buddy discount save $10 per student). >>>>>>>Choose a date and register here. Take your dream and make it happen! But how? Sometimes it’s not about the technique, but about finding the right technique for YOU. How to determine the manifestation technique that will work best for your energetic frequency. 4 essential ingredients to manifestation that work together to bring changes to your life. A super-fast and fun technique which includes all 4 essential ingredients that you can do anywhere. Practical instruction for powerful results. This class is great in a small group! Bring a buddy or a few and save $10 per registration. Click the registration link below to get started. >>>>>>>>>>Choose a date and register here. Would you love to join couples in marriage? Wondering how to get started, and how to getbooked for weddings? Maybe you’d like to know step by step what to do to make a couple’s wedding ceremony something they’ll always love. Every year, couples are looking for someone to help them get married. Many are looking outside of a traditional place of worship, and want something special and unique. Wedding season is a busy one for those ready to offer this kind of service, and be part of one of the most important days in a couple’s life. Alice started officiating weddings in 2016. She officiated 30 weddings in 2016, 85 weddings in 2017, 100+ in 2018, and she has weddings booked through 2019, with more requests coming in each week. Alice has developed a system for being organized, productive, and creating unique customized ceremonies for her couples. She’ll share her process with you in this class.